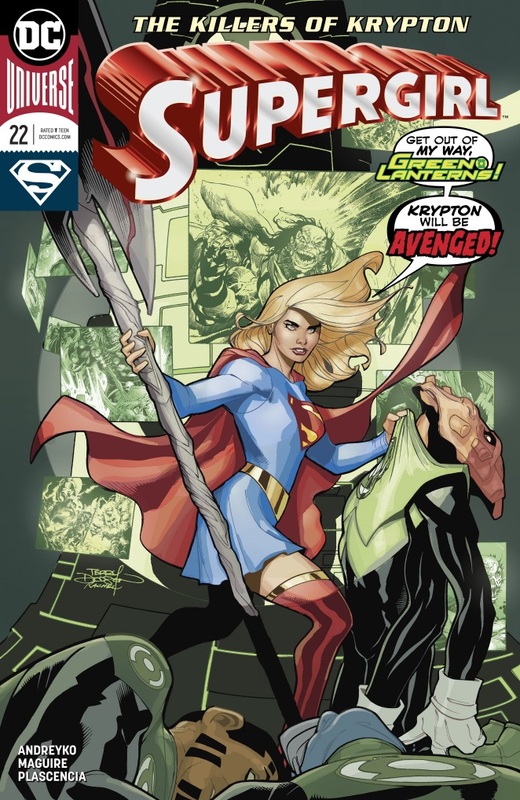 After a brief recap of the previous issue, Supergirl continues her search to learn more about Rogol Zaar and his role in the destruction of her home planet Krypton. With Krypto by her side they are en route to Mogo when her ship starts spiraling out of control. It seems Rogol Zaar's axe somehow managed to deactivate the central engine core of her ship, causing the ship to explode right outside of Mogo's atmosphere. Too far to make it to Mogo before the air runs out for both Kara and Krypto, they are relieved when John Stewart, Kyle Rayner, and BD'G come to their rescue. She is granted access to one area that houses a lot of information but is not granted access to the area which she seeks until clearance is given, paperwork filled out, by the same alien species that panicked in the last issue, accept this one was a different color. Kara decides it's best to sneak out at night and break into the restricted area to seek the information she desires when she is caught by another Lantern inside. Rogol Zaar's weapon once again comes to life. This time shaping itself into a giant Axe and swings itself towards the Lantern. With all her strength Kara stops the axe from impacting the Lantern's skull. More Lanterns show up and are puzzled by Kara's actions and demand her to drop the weapon and surrender. She calls Krypto for help when the Axe starts to unleash a bright light and transports her away from Mogo to an unknown location where she sees an image of a Guardian called Appa Ali Apsa and informs her that he is no longer alive and this is his last Will and Testament. He was part of a Cabal that unleashed Rogol Zaar and that it is their hands that are soaked in the blood of billions. "The group known as the Circle will now pay for their crimes with the help of you Supergirl." Story - 4: While I was not as blown away as last issue, this story already has me more enthralled than the entire run from its predecessor. That being said, the recap seemed a bit too long, it was after all last issue. There was a good balance of humor as well as serious tones that made for an enjoyable read. Marc Andreyko is crafting a wonderful new chapter in the life of Kara Zor-El, one that i believe is going to redefine who she is as a character going forward. Art - 3: This one for me was a step down from last month. Many pages were hit or miss, and there was too many that missed to give it a higher score. The one area that was exceptional was his work on Krypto, every panel Krypto was in was a stunning piece of work and if they were to ever do a solo Krypto issue, Maguire would be my first choice. I enjoyed the change of costumes when she was trying to sneak in at night, and that last page was almost worth the price of the book alone. Simply beautiful! But lack of consistency hurt the overall appeal to this issue. Cover Art - 5: First off I have a nostalgic soft spot for the use of word balloons on the cover. So right away that's a plus. The words draw the reader in and tells us what to expect in the pages inside. The art, just stunning, but it is the Dodsons, and when you see their name associated with a project you begin to expect a quality piece of art. I do have a minor gripe... the costume they used. This costume should have been on the last issue, and vice versa. Having her in stealth costume on this cover makes more sense. However, it is not enough for me to lower the rating, this is a five all day.